Shortly after the Lakers laced up their sneakers, worked up a sweat and studied some film, Steve Nash sensed the peaceful settings surrounding him. Only a season after a lack of training camp under coach Mike D’Antoni provided a poor foundation toward a first-round flameout to the San Antonio Spurs, the Lakers have yearned for this moment. The time when the Lakers have a full two weeks to iron out concepts and rotations. The time when they can play basketball without worrying about the bottom-line results. The time when they can build chemistry naturally instead of mixing in formulas that don’t work. The dynamic created an environment so striking during the Lakers’ opening weekend of training camp that Nash couldn’t help but point it out to D’Antoni. The Lakers entered last season rife with expectations stemmed from key acquisitions in Nash and Dwight Howard joining a star-studded cast featuring Kobe Bryant, Pau Gasol and Metta World Peace. The Lakers enter this season with a panel of ESPN writers predicting they’ll finish in 12th place out of 15 Western Conference teams. The Lakers spent all of last year’s training camp under Mike Brown learning elements of the Princeton-based offense, a complicated system based on cuts, passing and various reads based on how opposing teams defend. The Lakers then fired Brown following a 1-4 start and brought in D’Antoni, whose pick-and-roll heavy offense provided a stark contrast both in its pace and simplicity. The Lakers had little time to learn it. Nash, who ran the offense well enough to earn two NBA MVPs in four seasons with the Phoenix Suns, stayed sidelined for seven weeks because of a fractured left leg, leaving the Lakers without a significant piece to build offensive chemistry. Meanwhile, the Lakers openly bickered at seemingly everything. Players balked at D’Antoni’s fast-paced system. Howard lamented not being featured enough on offense. The Lakers remained frustrated when the litany of injuries never ended. The Lakers see that in various ways. D’Antoni estimated about “90 percent” of the Lakers’ roster participated in the team’s informal workouts in the past month. Nash, who played four seasons under D’Antoni in Phoenix, praised how he finds the right balance in training camp between teaching and ensuring enough rest to prevent burnout. Aside from the two-a-day sessions, D’Antoni’s practices last two hours and entail a mix of film study, individual drills and full-court scrimmages in an efficient manner. 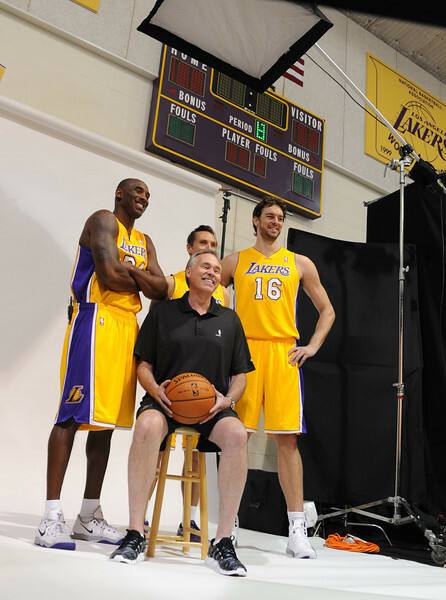 What difference will a full training camp do for D’Antoni? The Lakers went through that process last year with mixed results. D’Antoni featured Gasol as a reserve in favor of Earl Clark both because of Gasol’s ailing knees and D’Antoni’s preference for a smaller and quicker lineup. Bryant took over ball-handling abilities, while Nash became a shooting guard in hopes to create an offense less dependent on Bryant. The Lakers soon closed out the season 28-12 by leaning on Bryant’s heroics and a more post-oriented game with Howard and Gasol. That roster features a wide crop of young and athletic players on one-year contracts, including Nick Young, Wesley Johnson, Jordan Farmar and Xavier Henry, eager to earn a spot on the rotation and possibly a long-term deal. The Lakers also have center Chris Kaman, a 10-year veteran that remains dependable on mid-range jumper and pick-and-roll plays. Of course, the Lakers don’t have the drama surrounding Howard’s future remaining a constant backdrop. Bryant remains sidelined because of a torn left Achilles tendon. Gasol and Nash will miss the second portion of the Lakers’ three two-a-day sessions as they recover from their respective hamstring and knee injuries. The Lakers may have a good-riddance attitude toward Howard both for his attitude and never really fitting in with the Lakers. But his departure to Houston coupled with Metta World Peace being waived through the amnesty provision leaves the Lakers with a dropoff in talent. Can the Lakers overcome that? This entry was posted in Lakers, Pau Gasol, Steve Nash by Mark Medina. Bookmark the permalink. Of course with the drama queen out of the picture it’s expected.